In the course of the Worldwide Partner Conference (July 8-12, 2012) Microsoft presented this schedule. It seems to include a few odd milestones, but actually all of them were presented to the public in the past. Below is a table which lists each milestone plus corresponding build number and the place of presentation. 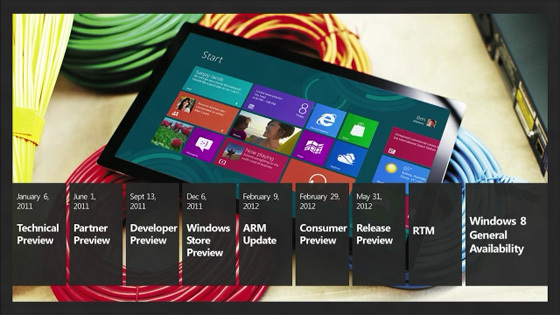 According to Paul Thurrott, Microsoft released 8 Developer Preview versions to its testers since September 2011. All of these Windows 8 releases — public and secret — included new APIs and system capabilities, updated developer tools, better performance and reliability, and responses to developer feedback. Windows 8 Developer Preview 2 ? Windows 8 Developer Preview 3 ?